low weight, small packing dimension - perfect for travelling! The Kettler Tube Set can be used in many ways to improve strength, endurance and coordination. The elastic resistance is excellent for an effective training of the whole body, since you can control the intensity of training. 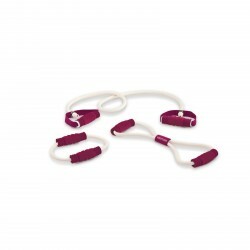 Moreover, you can train different body areas at the same time with the Kettler Tube Set. Easy handling and the low weight make the Kettler Tube Set an ideal and sporty travel companion. A handy carry bag is included in the delivery of the Kettler Tube Set.